Looking for an innovative way to add a contemporary flair to your bathroom design in a manner that is both practical and stylish? Try dressing up your shower with a unique wire mesh shower curtain, created with woven wire fabric from Cascade Coil Drapery. This unusual material makes some of the most luxurious, beautiful, durable, and easy to maintain shower curtains that you will find anywhere. 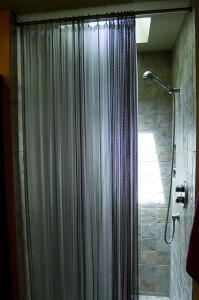 Shower curtains made from Cascade Coil Drapery's wire mesh fabric provide light control ad privacy. The fabric is ideally suited for all types of partitioning purposes, and it can do a great job separating your shower from the other areas of your bathroom in style. Your wire mesh shower curtain is simple to install. Even though the curtain looks like it might be heavy, it is in fact very lightweight. The durable material can last a lifetime, and requires online minimal dusting or vacuuming to stay in tip top condition. This flexible and versatile fabric is used for a wide variety of commercial and residential interior design applications. It's also utilized for such varied purposes as containing birds, cladding buildings, in industrial safety, and as protection against explosions. For more information, see www.CascadeCoil.com.